Trek Geek: A Trek Anew! What You don't have your enterprise model and 12 inch action figure yet?! Better get a move on it Mr! Ok so it's April 30th, 5 in the afternoon... my best nerd buddy has called and issued a call to be at the AMC Dundas by 7pm... My heart begins to race as I know whats up! 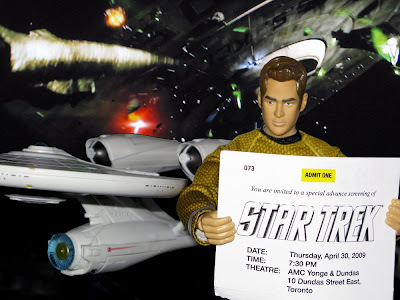 I'm about to be included in the very first showing of the new JJ Abrams Star Trek Movie in Canada! I pack my bag at work and I am out of there at warp speed! Making to the theater with time to spare we meet up for what was one of the best movie going experiences in a long time. Thats right! This film while not with out it flaws is a great movie on so many levels and while I will not get into each and every moment I am about to write some minor spoilers... so look at the next two pictures and if you want to know more keep reading, if not come back to this post after you have seen the flick! Epic! 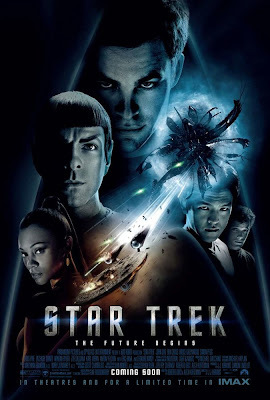 with a capitol E best describes what JJ Abrams has brought to the screen with this 11th Star Trek film. This is was the minimum requirement if this movie was to succeed! JJ gets an A+ here. Six months back if you had asked me what I thought about the initial images coming out of Paramount I would have given a very visceral response, in fact I might have told you that this was the end of the franchise as the die hard fans knew it. 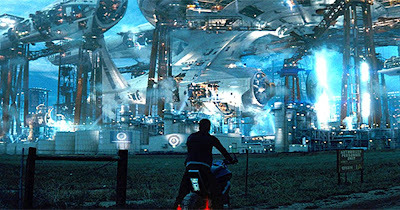 Take the next image... when I first saw the trailer and saw them constructing the Enterprise on the ground it was a big WTF moment! After working on the Enterprise my self over the years this was clearly a travesty of canon. I felt insulted! No really I felt insulted at having bought into a carefully crafted history and look to what in my mind was already established in the hundreds if not thousands of dollars worth of Star Trek books and models, props and costumes now seemingly washed away with what seemed like crap on the screen. How could this have happened? 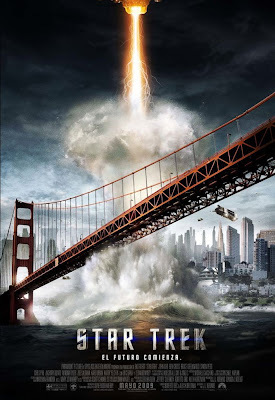 Even the guy who drove Star Trek into a wall Rick Berman couldn't have fracked it up this bad!? But then bits of the story outline began to surface... Leonard Nimoy was in the film... If hes in it certainly he has a say on some of this right? A plot with time travel and altered time lines began to appear??? Hmmm Finally the release of Countdown a four part comic book prequel hits the shelf and suddenly and magically the Vail of doubt and hate is lifted off of this film. At least for me. This recreation of the two iconic characters really drives home how great a casting job JJ and team actually did! In fact casing was key to this entire film! The contributions of Simon Peg (Scotty) and Karl Urban (McCoy) are freakishly on spot for their characters providing some of the most humorous moments in the movie. This movie is about action and after running at a medium pace for the first 30 min the movie kicks it into warp drive(which is really kewl in this version) and never looks back and if I had one critic of the film itself is that the pace never lets up... there is now emotional up and down which causes the final act to feel a bit less than satisfying. But this is a small critic and should not dissuade you from enjoying the action. As I have said this is a fun filled experience and the story reset allows for many new adventures with this heroic crew! EN Pros: Fab casting, great script, An epic canvas, the film stays within canon. EN Cons: Lack of dramatic build up, Spock and Uhuru? WTF!, Tyler Perry! (I'm serious he is in this movie!) As Madea he is flawless! but its that association that makes him being head of Star Fleet hard to swallow. Why I Live In Gene Roddenberry's World!